Omaha Steaks announced today that nearly 90 percent of the respondents to their recent nationwide Valentine’s Day survey of the general U.S. population, indicated that they would enjoy their Valentine surprising them this year with a romantic dinner for two at home. With The Romantic Dinner In, we give you everything you need to avoid the crowds and share a quiet romantic dinner at home with your Valentine. When asked about the advantages of celebrating Valentine’s Day at home respondents indicated that they prefer to avoid crowds (69 percent), they prefer a quiet atmosphere (67 percent), and a less expensive meal (65 percent). When it comes to what’s on the menu, steak/roast, lobster/shrimp, and surf & turf were the most popular entrees accounting for more than 57 percent of responses. 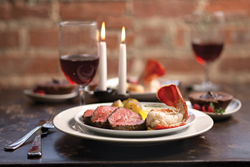 For more information on The Romantic Dinner In and other Valentine’s Day meal options, visit http://www.OmahaSteaks.com/Valentine. Founded in 1917, Omaha Steaks is a fifth-generation, family-owned company known nationwide for the finest in USDA-approved, grain fed beef and gourmet foods. Today, Omaha Steaks is recognized as the nation’s largest direct response marketer of beef and gourmet foods available through multiple marketing channels including by phone at 1-800-228-9055, online at http://www.OmahaSteaks.com or at retail stores nationwide.